© 2004 Pate-Meadows Designs, Inc. This simple design with a lot of detail is a unique valance with tabs and buttons. It can be adapted to fit various window widths, or as shown below, shower toppers. The finished length of the valance is approximately 20 inches from the top of the valance to the bottom. 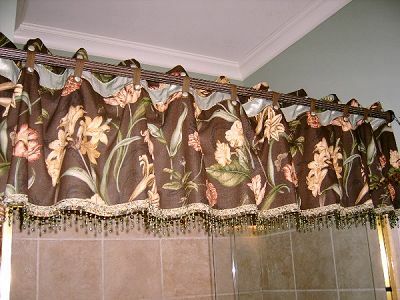 This valance works best when constructed out of a medium to heavy-weight decorative fabric for the face fabric and tabs. We recommend a medium-weight fabric for the piping and contrast band behind the tabs. The valance in the picture is mounted on a 1-3/8” decorative rod, but the tabs and contrast area of fabric can be adapted to suit larger pole. These amounts are for a valance measuring 39-44” wide finished. See pattern for other window widths; amounts are based on 54” wide fabric. Allow extra fabric to match patterns and plaids. 1 ½ yards fabric to cover buttons and piping.